Tree Speak | Casey Trees: Why Plant in the Fall? Fall doesn't just present an opportunity to watch leaves burst into vibrant red, oranges and yellows, it also is the ideal time to plant new trees. Why plant in fall versus spring, summer or winter? In fall, trees enter dormancy. During dormancy, no growth occurs in the upper branches and attention is given to growing a stronger root system which will better support foliage growth in the spring. And since fall brings much cooler temperatures, trees are under less heat stress and therefore require less water. (Note that less water doesn't mean no water - continue to water your trees until the ground freezes.) Additionally, pests and pathogens that can harm trees tend to be less vigorous during this time of year - a definite plus for susceptible young trees. 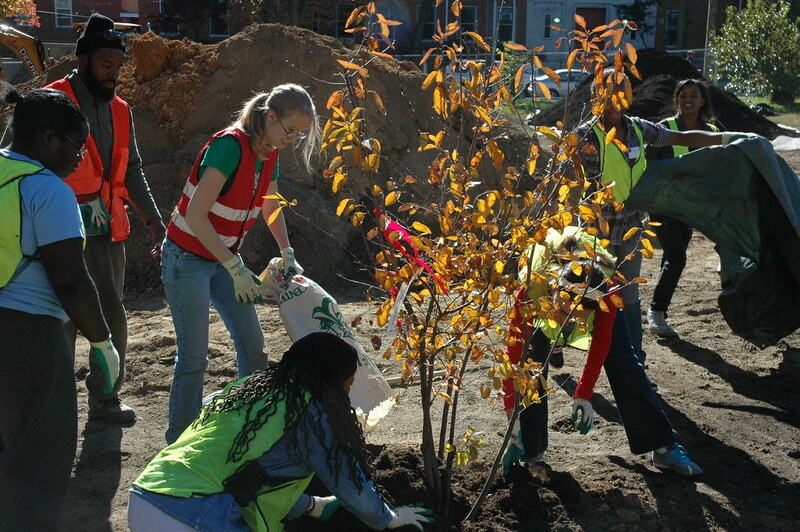 Volunteers help plant a tree with brilliant foliage during a CTP last fall. So make a pledge to plant a tree at your home today. Our Tree Rebate program - good for up to $100 - can help. Doing so will guarantee you more fall foliage for you and your family to enjoy in the coming years.